A fresh coat of paint and a ton of new features. We probably don't need to tell you that Gmail has become the email service of choice for innumerable people since it first went live in 2004. New features have been added at a steady clip ever since, but we haven't really seen a big redesign since 2011, though you could consider the addition of inbox tabs in 2013 a significant change, too. Whispers started cropping up earlier this month of another considerable overhaul, which Google is formally revealing today. What's immediately obvious is the new flatter, cleaner look intended to bring Gmail more in line with Google's Material Design principles -- the web version of Calendar got similar treatment last year. The bulk of what's new here, though, is a swath of features designed to make Gmail a more productive place for business users. But the updates apply to Gmail as a whole, so there's plenty for the personal user to play around with, too. There are several features in the big Gmail update everyone is likely to appreciate. 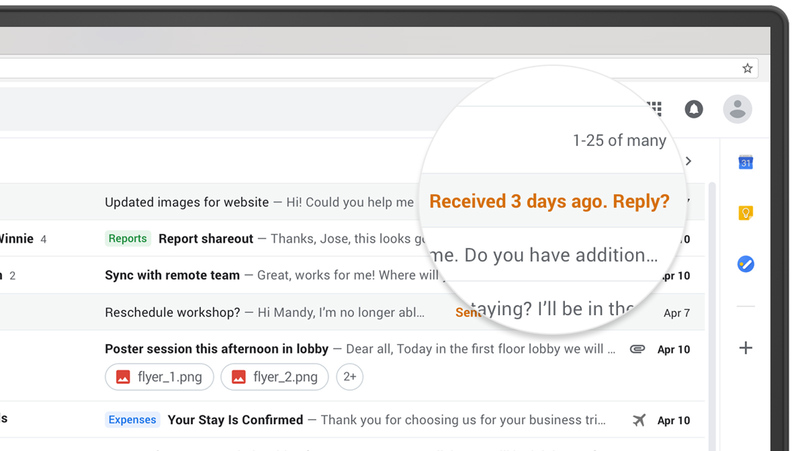 In general, managing your inbox should get a lot easier thanks to new action buttons for individual emails. Usually you'd have to either go into an email or click the left tickbox to deal with it. Now all you have to do is hover over an email and buttons for deleting, archiving and snoozing will appear on the righthand side. Similarly, attachments are historically something you've had to go into an email to see. Little buttons Google calls "chips" now show up beneath the subject line of emails with attachments, allowing you to open them up from the main inbox screen. All of the above shortcuts are only available in certain viewing modes, mind, and you'll pick which one of these you prefer when you load up the new Gmail for the first time. You're likely familiar with the different 'display densities' Gmail offers, so be aware that if you want to continue seeing as many emails as humanly possible on the one screen, you'll have to forego these new features. Smart Reply has been available in the Gmail mobile apps (and others) for a while, and now they're coming to the web. That means a canned response to your brother's BBQ save-the-date along the lines of "Sounds good!" will be just one click away. There's also a new 'assisted unsubscribe' feature that'll notice if you're getting weekly promotional blasts you never read. When the next one lands, it'll appear alongside a little card that lets you quickly take yourself off the list without digging into the email's small print to find the link. This will show up in the mobile apps too, and is actually one of the tools making the transition from Google Inbox -- the client the company tends to use as a testbed for experimental features. Gmail already flags emails that are blatant phishing attempts or seem pretty sketchy in general, but this feature is ditching all subtlety. Open one of these up and you'll now see a huge red banner that is your cue to immediately delete the thing and move on. By far the biggest change to the overall look of Gmail is a new side panel off to the right that lets you load up other Google apps alongside your inbox. You can, for example, see your calendar in that panel, meaning you don't have to switch tabs to add an event you've just received an email about. Or maybe you want to add a note to Google Keep or your Tasks list. 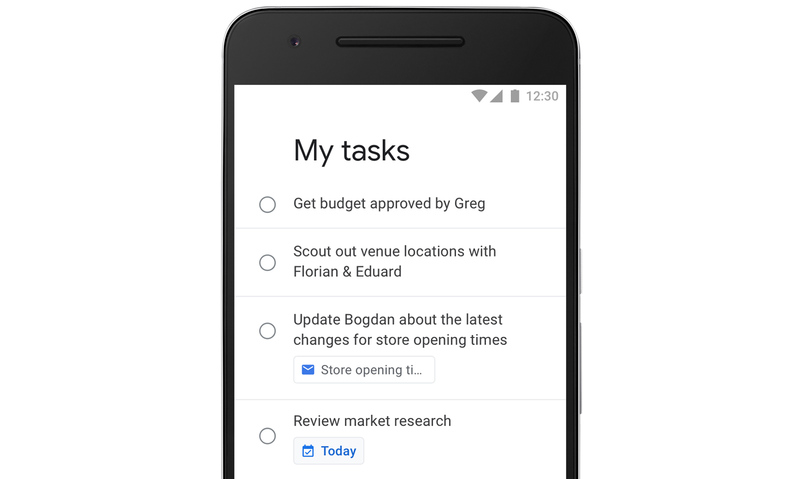 If you haven't used Tasks before, it's a very simple to-do list app integrated into Gmail. This is finally getting a visual refresh, moving away from the basic plain text look to something more fitting of the decade. Dedicated iOS and Android apps for Tasks are also being launched to make it more useful when you're away from your laptop. Using the side panel does mean losing some screen real estate to accommodate your calendar or what have you, but to make up for that you can now hide the left side rail to temporarily declutter. While the side panel sounds great for all types of use cases, the idea is Gmail's third-party add-ons -- the majority of which are geared towards enterprise -- will be particularly handy in this new spot next to your inbox. The side panel will become a feature common to several Google apps in the future, so eventually you'll be able to have, say, a G Doc sitting next to a Slide presentation. Just as there are aspects of the big Gmail update that'll be useful for all, there are some new features geared specifically towards G Suite enterprise accounts. In the one camp are those intended to boost productivity, like the option to temporarily suspend all but the most important of push notifications. Google's secret sauce will figure out when an email is urgent and let you know; otherwise, radio silence. This should be especially useful on mobile, stopping you getting distracted every 10 seconds by a company-wide thread about the Friday drinks location. Nudging is another new, automated feature that should more or less eliminate the need to constantly revisit the bottom of your inbox or sent folder. Google's algorithms will detect emails that look like they need replying to, but that you might not have thought about in a few days. Gmail will 'nudge' these emails to the top of your inbox and add a little note reminding you to think about replying. Similarly, if you've sent an email that has gone unanswered, this will be flagged so you can send a follow-up if you need to. Possibly the best news of all, at least for anyone that's tried to catch up on emails on a plane using the clunky Gmail Offline Chrome extension, is native offline support. Your Gmail tab now syncs the last 90 days of activity, so take your laptop offline and that same tab should work as normal. Naturally, you can't send or receive emails, but you can manage your inbox and queue up replies for when you're next in WiFi range. Making Gmail a more secure place to operate is another big push in this update. There's a new "Confidential mode" for emails a sender doesn't want permanently sitting in your inbox. 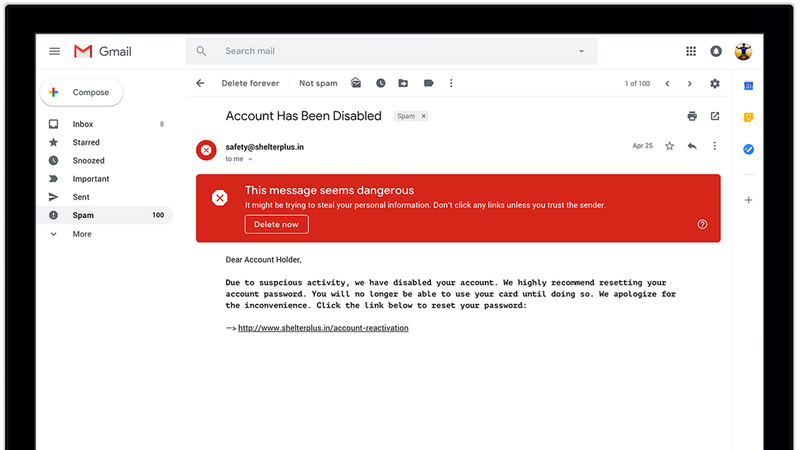 The sender can set an expiration date for any sensitive comms, or manually self-destruct them whenever -- these emails are also stored in the sender's Gmail account, not in some other random part of Google's cloud. The sender can even enable two-factor authentication, meaning the recipient must request an access code via SMS before they can access the contents (this is in case an inbox is potentially already compromised). In addition, these emails will have special rights management controls, effectively disabling the recipient's ability to copy, forward, download or print an email. This won't stop someone that really wants to leak sensitive information. They could always just take a screenshot, or snap a picture of an email on their phone, but it adds a bit more friction Google hopes will prevent accidents (an unintended forward, for example) and deter those that will give up when they realize they can't easily print a sensitive email in a few clicks. There's a lot of moving parts to this update, not all of which you'll start seeing immediately. 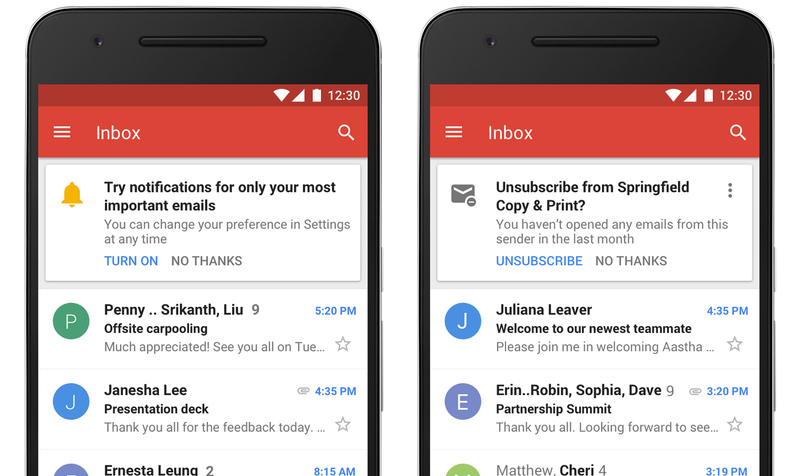 Your Gmail mobile apps will need to update, for example, and certain smart features like assisted unsubscribe will need a while to figure out what constitutes spam before offering the quick out. Confidential mode will be available in a few weeks, and if you're a G Suite user, your administrator will be responsible for flipping the switch on your account. The core redesign is live for everyone worldwide as of today, though, so just head into the settings menu to opt-in by hitting that "Try the new Gmail" button. In the coming months, Google plans to run in-app promotions to encourage people to make the move manually, before eventually enabling it by default and retiring the old Gmail forever.